I came home today pretty hungry and not in the mood to cook anything all, but my options are very limited when my kitchen is full of whole foods with no ready to eat options and snacks are always a combination of fruit and nut :/. I've been mastering the art of quick meals these days and find eating out of a fry pan so satisfying! My favourite season and month are back! April 2015 was a sweet and kind month to me. I had a cheese platter for dinner one night last April ... all to myself and of course it was a platter for two. It was the most memorable meal of 2015. A year later, the idea of eating dairy and sugar is almost unthinkable. 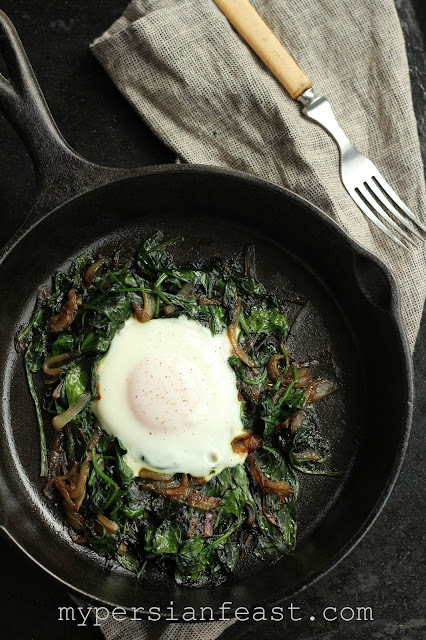 The most memorable meal of 2016 so far is this spinach and egg dish. It's simple, satisfying, nutritious and super quick but let me suggest to you try eating out of a pan ... hold it by the handle and fork in your other hand. Stand in the middle of you kitchen, like no one is watching and eat every bit of food you've cooked. Trust me, it tastes better. Perhaps, before you do that, make sure you are not using a cast iron fry pan or a Scanpan cos that'll involve a trip to the hospital. To make this super quick meal, all you need is an onion, 2 cups of baby spinach leaves firmly packed and 1 egg. Add a generous amount of olive oil to a heated fry pan. Slice 1 medium onion and saute until brown (add crushed garlic and turmeric if you prefer). Add the spinach leaves and stir until wilted. Break one egg in the middle, reduce heat and put the lid on to cook the egg to your liking for 3-5 minutes. Season with salt and pepper. Do not over cook the spinach leaves.